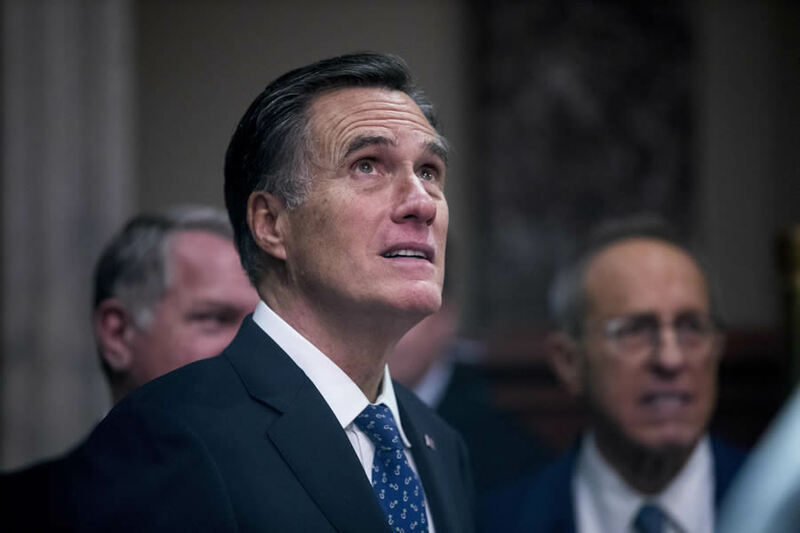 Sen. Mitt Romney, R-Utah, waits to participate in a mock swearing in ceremony in the Old Senate Chamber on Capitol Hill in Washington, Thursday, Jan. 3, 2019, as the 116th Congress begins. Something seems to compel those in the never-Trump crowd not only to perpetually obsess over Trump but also to constantly remind us of their profound distaste for him — lest it escape our top-of-mind awareness. A few things popped out at me when I read Romney’s piece — apart from his flagrant hypocrisy in reigniting his public relations campaign against Trump after abandoning it when seeking to be Trump’s secretary of state. Why did Romney believe he needed to write this now — as his first volley — instead of first expressing his intention of trying to work with Trump to move his agenda forward in what promises to be a very tumultuous time, with militant, partisan Democrats about to assume control of the House? Why would Romney choose to publish his piece in the overtly liberal Washington Post? Are political liberals and the mainstream media his constituency now? It would be one thing for a newly minted GOP senator to take on Democrats in that publication, but it’s quite another for him to harshly criticize his party’s president in a paper that exclusively speaks for the opposition party — a party that will doubtlessly leverage this op-ed against the president and in favor of the Democrats’ policy agenda, which Romney has been telling us for years he abhors. Does Romney mean to undermine and demonize GOP border enforcement hawks and other Republicans at this critical time when he piously proclaims that he “will speak out against significant statements or actions that are divisive, racist, sexist, anti-immigrant, dishonest or destructive to democratic institutions”? Exactly what statements or actions is he calling racist and anti-immigrant? I ask because I’ve heard some never-Trumpers outright denounce border enforcement supporters as nativists and racists not because any statements they’ve made could remotely be construed as anti-immigrant and racist but because they callously and wrongly presume or pretend to presume that their fierce opposition to illegal immigration and their desire to encourage assimilation and preserve national sovereignty, the rule of law and an orderly immigration process are somehow racist. This is below the belt, destructive and, yes, quite divisive, Mr. Romney — with your own party, no less. What other statements or actions of President Trump does Romney consider divisive? Is he equally agitated over the Democrats’ unapologetic divisiveness, or is his angst reserved only for Trump and his Republican supporters? Stated another way, if Romney was so eager to write an op-ed before he’d even set foot in the Senate, why didn’t he use it to call out Democrats for telegraphing their intent to use their newfound control of the House to unleash partisan h*** on President Trump? Or is making nice with these self-pronounced partisan militants and their media cheerleaders more important to Romney than fighting their toxic agenda? What Trump actions does Romney believe are “destructive to democratic institutions”? I, for one, am tired of hearing this Democratic trope that Trump is threatening our democratic institutions when he has done nothing of the sort and has been appointing constitutionalist judges who are dedicated to shoring up our democratic institutions and, unlike President Obama, has refrained from issuing lawless executive orders to advance his agenda. Why, Mr. Romney, do you want to legitimize this false charge against President Trump? We Republicans faithfully supported you in your 2012 presidential bid and wouldn’t have considered undercutting you like this. Why, Mr. Romney, do you feel it is necessary to announce that you “will support policies that (you) believe are in the best interest of the country and (your state), and oppose those that are not”? How many Democrats would send a public message to the country that by gosh, they will not support their president if he’s doing things they believe are not in the country’s best interest? Can’t some things just be left unsaid, or is it necessary in every other paragraph to remind Americans that Trump embarrasses you and you’ll only grudgingly support him — and then, only when you have to? Why couldn’t you have kept your powder dry rather than virtue-signal to leftists who’ll never love you any more than they did Sen. John McCain? Are you so consumed with distaste for Trump that you are blind to the Democrats’ far worse partisanship and divisiveness? Are you really unaware of the Democrats’ stated intentions to wage political war against Trump for the next two years or until they run him out of office? Do you not see that enabling the Democrats in this way could help to advance their nightmarish agenda? Which will you oppose more, Trump’s bad manners or the Democrats’ socialist, culturally nihilistic agenda? Which is less in the nation’s interest? It is not President Trump who threatens the nation’s interest, Mr. Romney, but the Democratic Party, which you have just gone out of your way to assist — whether you realize it or not.